Ringworm home remedies bring relief to some who have contracted this skin fungus. The medical name for ringworm is tinea. This skin infection may also show up in the hair or under the nails. Two fungi cause this skin problem: trichophyton and microsporum. This type of infection is easy to recognize because of its eruption pattern. Ringworms are not actually worms, but a circular fungal infection that appears raised up from the skin. Tinea spreads easily from person to person through touching contaminated brushes, clothing or skin. This condition begins with a red mark that slowly spreads outwards as the center heals. Burning and itching will occur. If tinea affects the scalp, the hair may fall out. 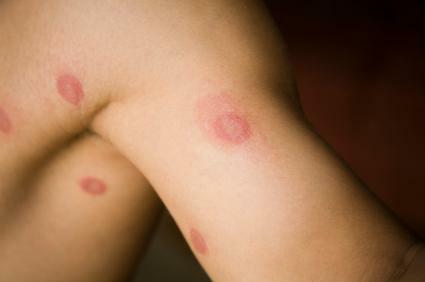 Ringworm thrives in moist body areas like the groin or between the fingers and toes. Start your ringworm treatment by keeping the affected area dry, clean and moisturized, and be sure to wash your hands thoroughly after every treatment. Skin ringworm will last for about one week, while the scalp variety may last for several weeks. Get relief from a ringworm condition with some home remedies. Reach in your refrigerator, pantry or medicine cabinet to make an effective treatment. Apple cider vinegar: Soak a clean dry washcloth or paper towel in apple cider vinegar. Wring the excess vinegar from the cloth, then lay the wet cloth on the wound for 15 minutes. Do this several times a day, using a new cloth or towel with each treatment. Tea tree oil: Clean the fungus infection with a clean damp cloth and some antibacterial soap. Pat the skin dry. Dip a clean cotton ball in tea tree oil. Dab the moist cotton ball on the ringworm, and repeat this two times daily until the area is clear. Holy basil: Place several basil leaves in a mortar and grind them with a pestle. Create a fresh paste to place on the fungus. Do this several times a day until the infection is clear. Papaya: Cool a papaya in the refrigerator for a few minutes before slicing it. Lay one slice on each of the ringworm-infected areas. Leave the slice on the skin for at least 10 minutes. Remove the slice and rinse it with warm water. Lavender oil: Mix two to three drops of lavender essential oil with one teaspoon of jojoba oil. Dip a cotton ball in the mix and rub it on the ringworm. Treat the areas after every shower or bath. Garlic: Garlic is a natural anti-fungal treatment. Peel and press several cloves of garlic to make a thick paste, and apply it to your skin several times a day. Turmeric: Mix one teaspoon of turmeric with a few drops of water to make a paste. Spread the paste on your ringworm and leave it in place for 10 minutes. Then rinse the paste away. If the infection is on your face, you may wish to avoid this treatment since turmeric is bright yellow and may temporarily stain your skin. Vegetable juice smoothie: Try a vegetable juice smoothie to fight this fungal infection. Carrots and spinach are considered especially good for fighting ringworm. Iodine: Dip a clean cotton swab in iodine. Dab the swab on the infected area. This treatment may sting a little and is not advised for children. Adults should repeat the iodine treatment for several days for best results. Natural treatments for ringworm are less likely to have dangerous side effects, but you should be observant. If you notice the infection looks worse, spreads significantly or you experience pain, you should see your physician. Discontinue any ringworm home remedies if you feel sick.